Close to Sea World & Lackland AFB. BMT Discounts! 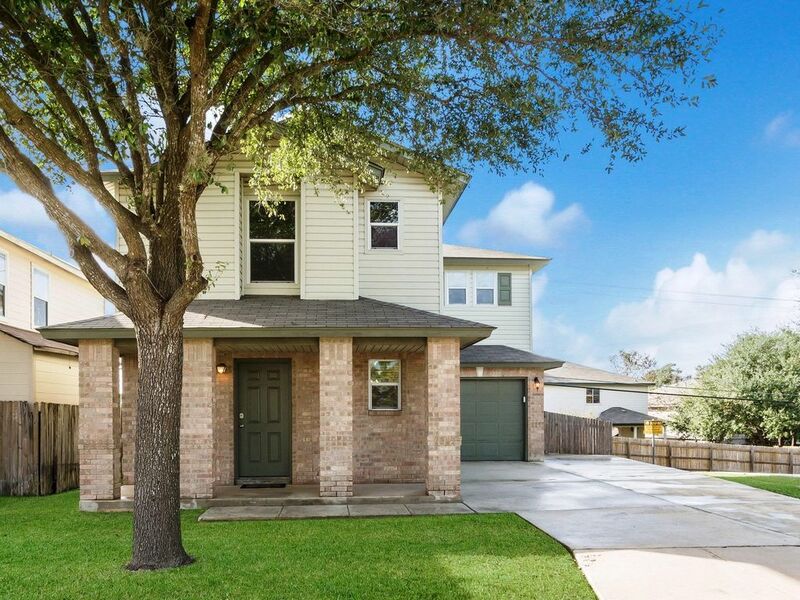 This home is located on San Antonio's Northwest side; less than a mile from Sea World. If you plan on attending Sea World, going back and forth to rest up and prepare meals at a fraction of the cost can help make your Sea World experience more enjoyable and affordable. We have also hosted over 100 BMT families! Staging your BMT graduation at my home will provide you an entire home for you and your Airman to enjoy! The neighborhood community does not allow street parking between the hours of 7pm to 7am. However, our driveway can accommodate approximately 4 vehicles, plus another vehicle in the garage. Use of overflow parking areas must obtain proper permits, or your vehicle will be towed. Regarding our sleeping accommodations, this is a three-bedroom home. The master bedroom features two beautiful Queen size beds to maximize the number of guests that we can sleep. One of the guest rooms features a plush full size bed and the third bedroom features a bunk bed set with a twin size on top, a twin size on bottom and another twin size bed underneath. If you would like, you could bring in an air mattress to place in the Family Room. Minimum age to rent: 28 years of age or older. If the above conditions and accommodations are a good fit for you and your guest party, WELCOME HOME! Hello! My name is Carlos; owner and founder of SA Vacay (San Antonio Vacation Rental Homes). I was born and raised in San Antonio, Texas. My wife Stephanie and I have 6 children; 4 boys and 2 girls! I am a God-fearing, bible believing Christian and seek to glorify God with this home and our commitment to service towards all of our guests. I am one of the deacons at Grace Community Church of San Antonio (www.gccsatx.com & www.illbehonest.com). If you are looking for a church to visit while in San Antonio, we would be glad to have you and your family! I enjoy working from home where my children are home-schooled. My wife enjoys gardening and raising her chickens; she wants a goat but I don't know about that. :-) I enjoy riding my bike at the San Antonio Mission Trails, Down Town, Riverwalk, and some other places, including a little off-road mountain biking. For the square footage, this property has a great layout! The driveway has been expanded to accommodate up to 4 vehicles and a large concrete patio has been added in the back yard. The children can enjoy play in the fully-enclosed backyard or at the park next door; park features high-end playground equipment. Sea World is located so close that you can hear screaming from the rollercoaster when outside. Access and distance to nearby necessities is all within 5 minutes. Starter Items include hand soap dispensers for all sinks (kitchen & 2.5 restrooms), shampoo, conditioner, and full bar of soap for both bath rooms. Bedding, Sheets, Comforters, Pillows, Pillow Cases, Lg. Bath Towels, Facial Towels, Wash Cloths, Kitchen & Dish Towels. equipped with a dart board and some board games. Bring your own laptop or wireless device for highspeed internet surfing. Extremely clean for every guest. Has an ice maker and Cools & Freezes perfectly. All small appliances purchased Aug 2011, dishes, glasses, cups, silverware, pots & pans, storage containers, pyrex, cooking utensils, knives etc... New Crock Pot, Blender, Coffee Maker, Toaster, Microwave and Tea Kettle. Starter items include Salt, Pepper, Coffee, Filters, Sugar, Creamer and bottled water. Need something? Just ask and I'll see what I can do for you. (2) 42' wall mounted flat screen in the family room and a 32' flat screen in the master bedroom. There is also a blu-ray player. (2) cable television in the livingroom and master bedroom. Have a Netflix subscription? Bring your login username and password and enjoy an endless video library. Concrete patio in the backyard. Handrail, two sets of stairs to enjoy the fully-enclosed back yard. Barbecue pit, 4 lounge chairs, 9 folding chairs, 6ft table for outdoor dining. Full Kitchen : All small appliances, dishes, glasses, cups, silverware, pots & pans, storage containers, pyrex, cooking utensils, knives etc... Crock Pot, Blender, Coffee Maker, Toaster, Microwave and Tea Kettle. Starter items include Dish Soap, Dish Sponge, Salt, Pepper, Coffee, Filters, Sugar, Creamer and bottled water. Need something? Just ask and I'll see what I can do for you. A pack n play is provided for families with infants or early toddlers. There are also some toys and books for toddlers. Linens Provided : All Bedding, Sheets, Comforters, Pillows, Pillow Cases, Lg. Bath Towels, Facial Towels, Wash Cloths, Kitchen & Dish Towels. Smoking Not Allowed : An ashtray is provided for your outdoor use. The property was well maintained and clean and secure which was a big deal for me. We were made to feel right at home and could stretch out and be comfortable. There was no Stone left unturned. Carlos and the staff thought of everything. I would definitely recommend this property and Carlos to anyone traveling to San Antonio. He even responded to an accidental dialing. Carlos Rocks. Stayed for our daughters BMT graduation. Location was great and Carlos was awesome! Everything went so smoothly. Great! It accommodated us in every way. It was very relaxing and enjoyable. Close to all the stores and entertainment. Just what we needed, and just a few minutes from Lackland. Eveything was just as it should be. Perfect place to lay our heads and gather for the weekend as we were in town for BMT graduation. Thanks again for the ability to stay in your home. Rented this home for the weekend to visit kids in college. It had everything we needed. Carlos, the owner, was very attentive. The property is as advertised. It is approximately 3 minutes to SeaWorld and less than 12 minutes to groceries and basic shopping. Carlos was very responsive to any questions we had. It was a pleasure to stay. Located under one (1) mile from Sea World and 8 miles from Lackland AFB the surrounding area has three (3) separate retail parks for shopping and dining within a five (5) mile radius. Within one mile, nearby convenience stores, pharmacies, grocery stores and delivery-type restaurants will help meet your immediate needs. Within two miles there is a brand new hospital with 24 hour ER for added convenience. Other area attractions: Six Flags Fiesta Texas (16 miles), Medina Lake (25 miles), Paradise Canyon Recreation Park (18.5 miles), Government Canyon State Natural Area (9.5 miles) and Downtown San Antonio - Alamo - Riverwalk - Missions, etc... (17 miles). AVAILABLE DISCOUNTS: You *may qualify for the following discounts off the Base/Standard nightly rental rates: - 10% for Active Military or BMT graduations. - Up to 10% off for Guest Loyalty (Ask about our guest loyalty program) *IMPORTANT NOTE ABOUT OUR PRICING AND DISCOUNTS: - Our Base/Standard Rate is $184 for a weeknight - Our Base/Standard Rate is $204 for weekends - At various times, we may offer specials and promotions that lower our nightly rental rates significantly for a limited time. We will honor qualified discounts up to the point of 25% off the Base/Standard Rates. We cannot offer or honor any additional discount beyond that point. NO RESERVATION HOLDS: Please note that we cannot hold the property; the first guest to successfully make a payment, will secure their stay dates. READY TO BOOK? When you are ready to book, you can secure your stay dates immediately with INSTANT BOOK! No more waiting for a reply to your reservation request only to lose your dates to another interested party. Use Instant Book by clicking the "Book Now" button and secure your dates today! If you need booking assistance, you may call a representative at 888-640-6970. Our Property ID is 908440.